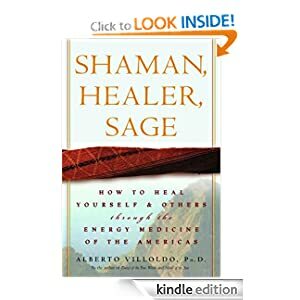 I resisted reading Shaman, Healer, Sage: How to Heal Yourself and Other With Energy Medicine of the Americas by Alberto Villoldo, Ph.d. It was that “shaman” word, which conjured up images of voodoo witch doctors to my Bible-Belt sensibilities. However, I’ve met a few women via the web over the last couple of years who are embracing shamanism and they appear to be lovely healers. So with mild trepidation, I downloaded a sample and soon found myself hitting the “buy” button. Shaman, Healer, Sage is a fascinating exploration of an ancient healing system written by a Western doctor and explorer. For myself, the greatest value of the book came from the detailed explantion of the energy fields and chakras. My personal experience sensing and working with the “Ever-Flowing Streams,” as I dubbed them in my spiritual memoir, has made them a great mystery. Villoldo’s book contains the most enlightening information I’ve read about what he calls the Luminous Energy Field. Giving up his mainstream Western medical research, Villoldo traveled to Inka and Amazon shamans to learn an entirely different world view and method of medicine. Shamans see and work with the energy fields that Western culture is only beginning to recognize. Villoldo keeps references to an earth-based religion to a minimum and mostly makes sense of the various properties of the human energy fields and how practitioners might help their patients. Personally, I had a huge “ah-ha” moment about three-quarters into the book when he talked about entities attaching themselves to people. If you’ve read Ever-Flowing Streams of Healing Energy, you’ll know that was ultimately the best explanation I had for a range of life-long difficulties. Until Shaman, Healer, Sage, I’d never come across a book that seemed to pin-point my situation. In Villoldo’s world, it’s very common! The last section of the book deals with the passage into death that every soul makes. People need to be helped out of the world as much as they need to be helped into the world. Once the spirit leaves the body, it goes through transitions into the spirit realm. Western culture has largely disconnected with the sacred, especially death rituals. Villoldo paints a compelling picture of what may be part of the journey and why it’s important to assist loved-ones, even after the body has ceased breathing. While I don’t feel the call to leap into shamanism, there is much to be learned from ancient traditions. Villoldo has written a range of books from his South American experiences. Perhaps we’re living in age when the imbalances of Western thinking will move toward more harmonious blend of other cultures and save the earth from destruction in the process. Fascinating ideas here, You are so right about the disconnect Western culture has with death. We have much to learn.